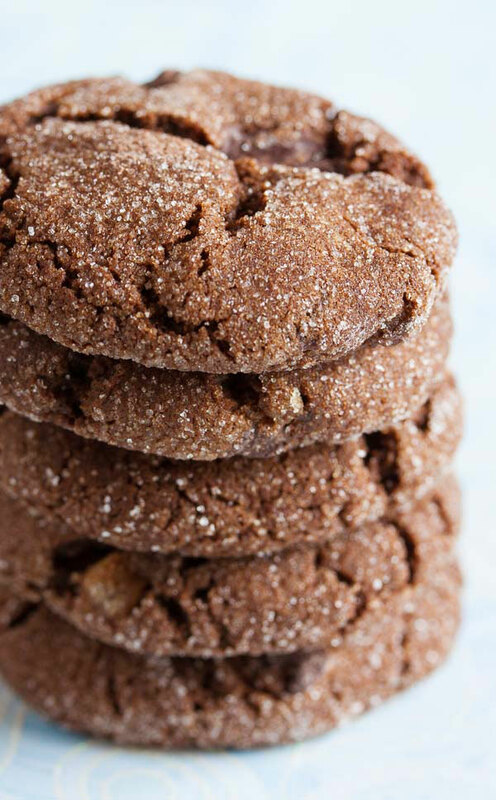 Chewy Chocolate Gingerbread Cookies | wanna come with? I made this cookie for xmas several years ago, and it instantly became not only one of my favourites, but among my friends and coworkers too. And it’s been a big part of my xmas tradition ever since. One year I brought them in to work and one of my coworkers actually hid them so no one else could have any. Seriously! This year, I had so many other recipes to try that this one got left out. But I had to promise to make it soon after the holidays. So here we are. 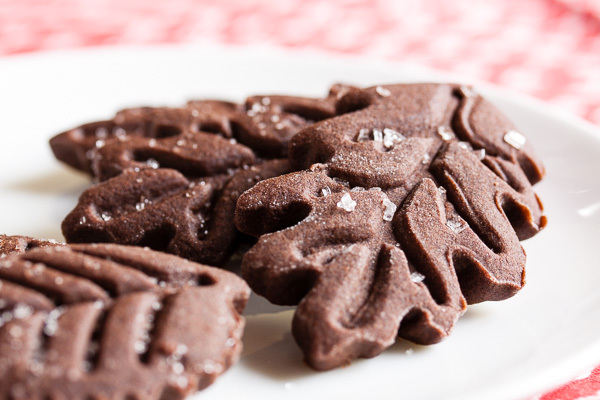 When I made the chocolate ginger leaf cookies back in November, I mentioned that I was hoping for more of a punch of flavour. I want to be clear that that isn’t a bad cookie, but when I saw chocolate + ginger, my tastebuds were expecting something more. That’s because I was already spoiled by this one. This cookie is the flavour I was expecting. All of the flavours in this cookie are very bold. If you prefer more subtle flavour, this is not the recipe for you. 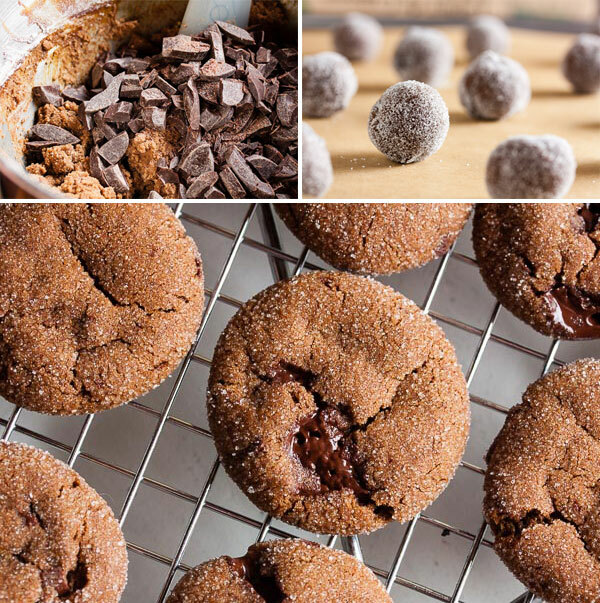 It has all the components of a good gingerbread – the spices and brown sugar and molasses – plus not only cocoa powder, but also a generous helping of chopped dark chocolate. Seriously, lots of dark chocolate chunks. And as if that’s not enough, there’s fresh grated ginger too. 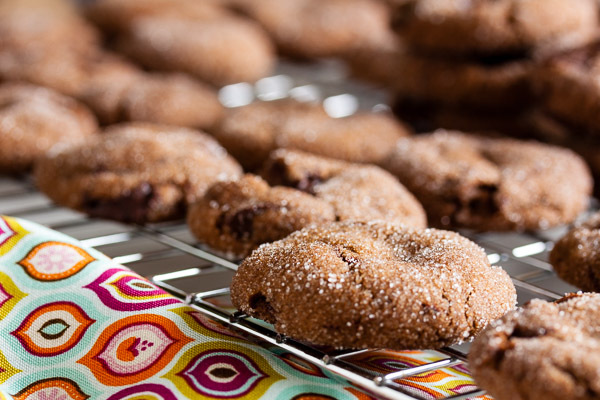 This is a soft and chewy cookie – fresh from the oven, however, the outer shell has a nice crunch while the inside is still soft and gooey. Rolling them in sugar gives them a bit of sparkle (pretty!) and adds just a bit more sweetness (the cookie itself isn’t that sweet). And contrasted with the heat from the fresh ginger, the chunks of chocolate feel almost icy cold. There’s so much going on in this cookie, and it all works. 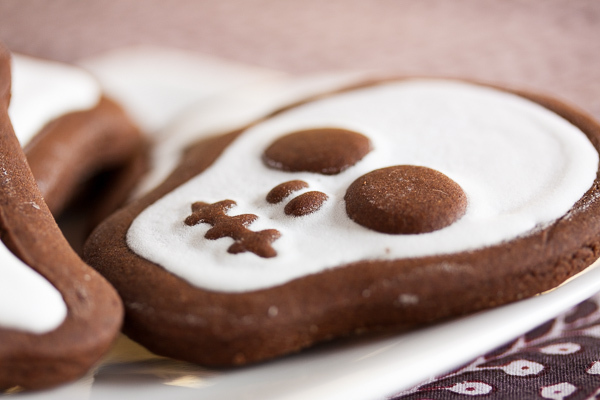 Adapted from Martha Stewart's Cookies. The recipe states it makes about 2 dozen when rolled in 1-1/2" balls. I rolled them a bit smaller and got over 3 dozen cookies. In a medium bowl, whisk together the flour, ground ginger, cinnamon, cloves, nutmeg, and cocoa powder. Set aside. In the bowl of a stand mixer fitted with the paddle attachment, beat the butter and grated ginger together on medium speed until light and fluffy, about 3 or 4 minutes. Scrape down the sides of the bowl and add the brown sugar, beating until combined. Add the molasses and beat again until combined. In a small bowl, dissolve the baking soda in the boiling water. Turn the mixer to low and blend in half the flour mixture, then the water-baking soda mixture, then the remaining flour mixture. Mix until just incorporated. Remove from the mixer and add in the chopped chocolate either with a spatula or by hand. I prefer to knead inclusions in by hand to ensure they're distributed evenly. Transfer the dough to a sheet of plastic wrap. Pat out to about 1-1/2" thickness, wrap well and refrigerate for at least 2 hours (or overnight). Form the dough into small balls (1" to 1-1/2") and roll each in the granulated sugar. Place about 2" apart on a baking sheet to allow for spreading. Bake for about 10-12 minutes, until the tops begin to crack, rotating the pan halfway through. 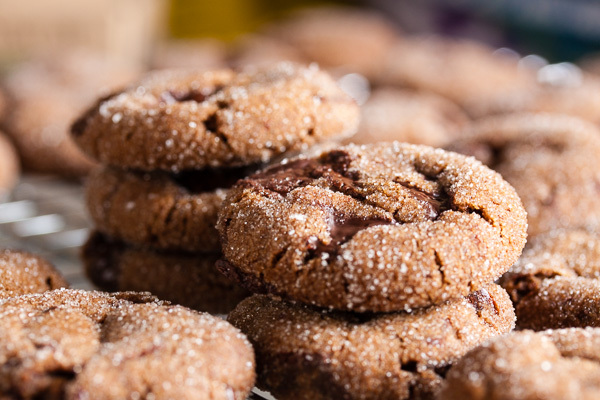 Allow to cool on a wire rack for a few minutes before removing the cookies from the pan and allowing them to cool completely. Hello and congratulations for your perfect site….!!!! I’m in love with this cookies and i have to bake them….!!!! Do you have ginger in two different forms,fresh and powder…?? And with what other product can i replace “unsulfured molasses” from your personal experience…??? Thank you so much for your time….!!! Thank you leonidas! I hope you love these cookies as much as I do. I could eat them all myself! And yes, there is both ground ginger (powder) and fresh grated ginger in this cookie. Do you have molasses where you are? I usually use “fancy” molasses. 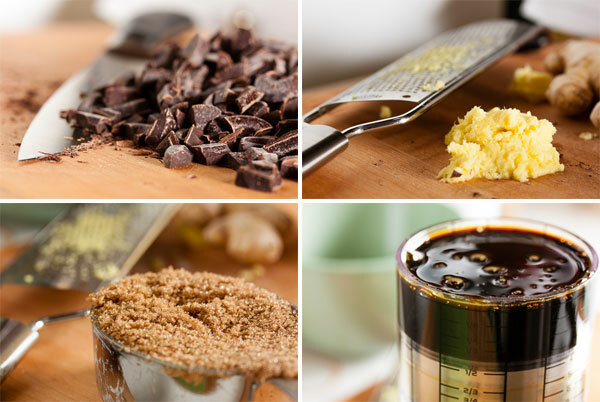 “Cooking” molasses will give you a deeper, stronger flavour. Congrats for this great recipe and thanks for your help. They came out JUST PERFECT….!!!!!!! I’m going for the “flo’s chocolate snaps” now, i will right you about….. I have looked for this recipe after having them at a local bakery. They’re awesome! How well do they freeze? Would it be better to freeze uncooked? Thanks! I’m going to make this recipe, but this should in absolutely no way be misinterpreted as my endorsement of the ridiculous number of photos you have used. I know, it’s not your fault. You’re just following in the footsteps of the Pioneer Woman who is a pioneer in the way she blazed a trail for digital SLR abuse. Wow. My first reaction to your comment was that was a pretty rude thing to say. I took another look at the post and you’re right, I had added too many photos. It was one of the earlier posts I’d made and I hadn’t found my groove yet. That said, if you’re not happy with someone’s blog, you can always go elsewhere. 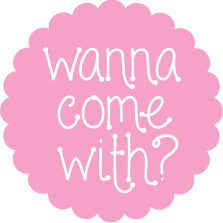 This is my blog and I can put whatever I want in here. And there’s really no need to insult another blogger too. Yikes, chill out. I bet your cookies will taste bitter. Good lawd, Ferg, I agree that a lot of baking sites use too many photos, but it’s rather a first-world concern, no? You can scroll past them and appreciate the overall good humor of the blogger as well. My sisters and I and our (now grown-up) children had our 25th (!) annual Cookie Day this weekend. We all get together and make cookies just before Christmas. This recipe was so good last year that we made it again this year. 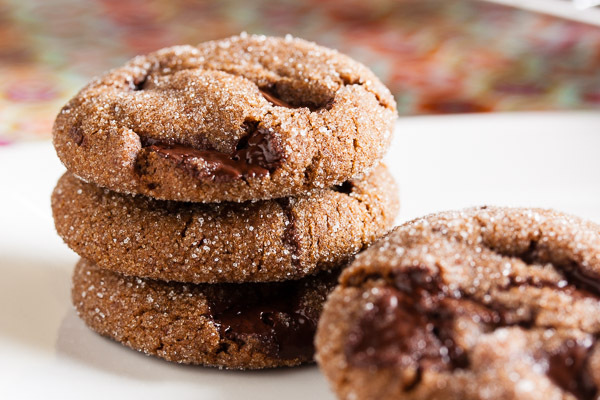 Love the combo of chocolate and ginger. The key to this recipe is not to bake it too long. Take them out of the oven when they still seem a bit soft and unbaked. 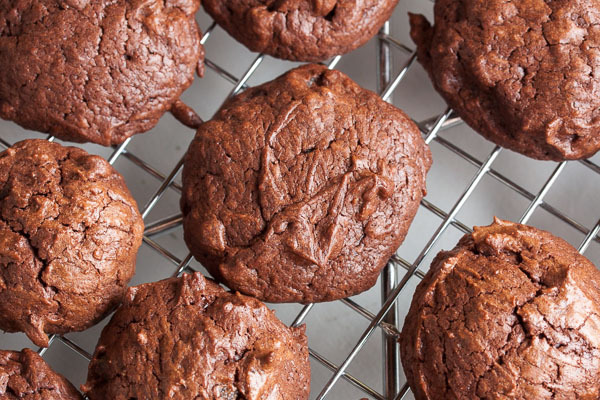 The texture is great when they cool (if you can wait that long to try them). For sure this will be on the list again next year. OMG these are AMAZING. I made some for a school bake sale. One guy bought 4 and then promptly came back and bought 3 more. I didn’t have ground cloves or nutmeg so substituted 1/2 tsp mixed spice instead. This recipe is going straight into my favourites folder! I love this cookie and have made them every Christmas for years. Recently I had a friend with Celiacs ask if I could try to make them gluten free. My first attempt was a disaster! Any suggestions? Hello! These look fantastic. Just checking, though-there’s no egg? Thank you! To answer my question, no egg is required. I made this recipe, and it is truly fantastic. A very rich, deep, dark taste, with the ginger and chocolate married perfectly. Highly recommended.